And then the economic crisis hit Ukraine. Everything that happened elsewhere happened here, but seemingly on a greater scale, since the Ukrainian economy had never been strong to begin with. In addition, the Ukrainian hryvnia rapidly lost 60% of its value relative to the U.S. dollar, and prices at the grocery store skyrocketed. We were fortunate in that our income is in U.S. dollars, so we weren't hit nearly as hard as our Ukrainian friends, but all the same, we still found ourselves paying around 30% more for food each month than we had previously. (Part of that could have been because our boys were growing and eating more.) Whatever the reasons, I realized that I needed to find cheaper ways to feed our family. Where did that leave lasagna? As any home economist knows, the combination of meat and cheese in one dish makes for an expensive meal. I could cook up a tasty vegetarian lasagna, perhaps, but with the price changes that came along with the crisis, we were finding that cheese actually cost more than meat! A meatless lasagna is one thing, but cheeseless?? Undeterred, I went to work. When it came to dairy products, milk and some varieties of curds were still inexpensive, and that gave me a brilliant idea. What if I substituted a white sauce for the cheese? If I made it thick enough, it might mimic the gooeyness of melted cheese. I cooked up my first tray of meatless, cheeseless lasagna, and it was great. It had a wonderful, creamy texture from the white sauce and a great flavor due to the combination of spices and tangy tomato sauce. I thought I was a culinary genius–until I discovered that lasagna as it is traditionally made in Italy calls for bechamel, a white sauce of French origin. I guess my idea wasn't so original after all. Over the next year or so, I kept experimenting with the recipe. At some point I added spinach and later carrots to transform it into a meal-in-one. (I know that carrots sound like a really weird addition, but it works. Trust me.) Meals-in-one are my secret weapon. My kids aren't big on eating their veggies, unless they're properly disguised in the middle of some other dish that they like. And besides, how many moms of small children have the time and energy to prepare more than one dish per meal?? I know I don't, so my menu planning repertoire regularly includes meals-in-one. This dish is one the whole family wolfs down, and it's not at all difficult to make! In fact, if you have a food processor to grate the carrots, you could easily put the whole thing together in 30 minutes. Then all you have to do is kick back while it bakes and enlist your kids to set the table for you. And maybe make some garlic bread. 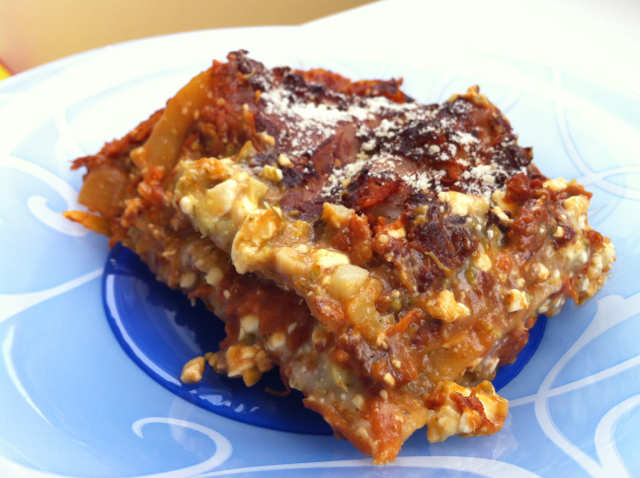 So without further ado, here is my recipe for budget lasagna. If you want the simple version, without pictures or added commentary, just scroll to the bottom. 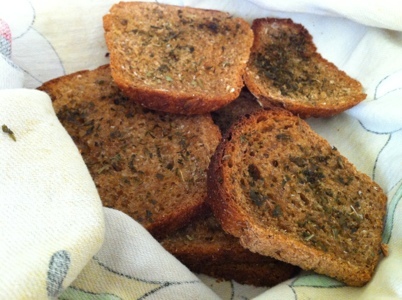 (But don't miss the bonus recipe for Super Simple Garlic Toast in the body of the post.) Enjoy! Or as they say in Ukraine, "Smachnoho!" Mince 1 onion and 4 cloves of garlic and sauté in a bit of oil in a medium pot over medium heat until onions are translucent. Stir in 4 cups of tomato sauce,1 1/4 teaspoons dried basil, 1 1/4 teaspoons dried oregano, 3/4 teaspoon dried thyme, 1 bay leaf, 1 1/2 teaspoons sugar, 2 large carrots, finely grated, and salt and pepper to taste. If you wanted, you could skip all the seasonings and just use commercial spaghetti sauce from a jar. I can't get one that I like here in Ukraine, so I do it the long way. But no matter what you do, make sure you add the carrots! 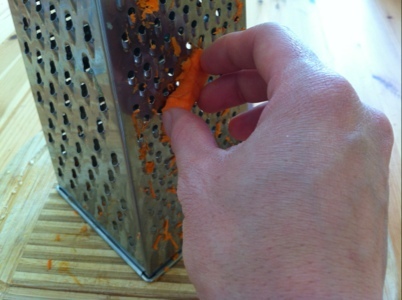 Grating the carrots on the small holes of your box grater (or food processor) has two advantages: 1) they cook super fast, and 2) your kids will never know that they're eating carrots! 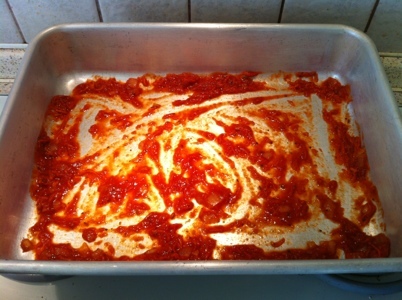 Bring to a boil, lower heat to medium low, cover, and simmer until you are ready to assemble the lasagna. If, like me, you only have one medium-sized pot, use a small pot for this step, because you'll need the medium pot for the next step. If your small pot is the same size as mine, it will be very full by this point. I guess you could use the medium pot for the sauce and a large pot for the next step, but who really wants to wash a large pot and a medium pot when they can get away with a medium pot and a small pot? Of course, you might have to clean up your stovetop when the sauce overflows the small pot, so I guess it's really a toss-up. I admit that I had to wipe off my stove before taking this picture. Mix 10 tablespoons of flour and 1 teaspoon of salt in a medium pot and drizzle in extra virgin olive oil, stirring with a wire whisk until a paste forms. This paste is called a roux (pronounced "roo") and is the basis of many sauces. It's supposed to be made with equal parts butter and flour. First you melt the butter then whisk in the flour, but I like to use extra virgin olive oil instead. It tastes a bit different than the original version, but it's much healthier and still tastes wonderful. I've found that it doesn't take as much olive oil as butter to make a roux, which is why I simply drizzle the oil in without measuring. Once a paste forms, you've got enough oil. Add 2 cups of low-fat or non-fat milk and cook over high heat, stirring constantly with a wire whisk, until the mixture comes to a boil. Traditional recipes for white sauce tell you to cook over low heat, stirring constantly, but who has the time for that?? Please, I'm a busy mom, not a professional chef! In my impatience, I've found that the sauce will turn out just fine if cooked over high heat. (And you don't even need to stir it constantly. You do need to stir very frequently, however, to keep the bottom from burning. So if one of my children has an emergency during this stage of the recipe, what I usually do is turn the heat to medium, run help the child, then dash back to the stove again.) 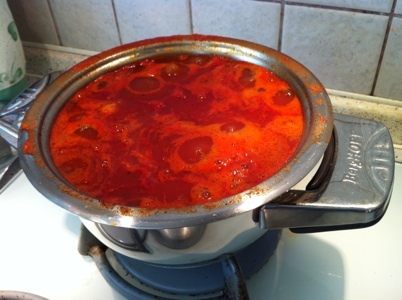 Once it boils, decrease the heat to medium and continue cooking and stirring until the sauce thickens. Don't worry; you'll know. This doesn't take long, and it will be extremely thick. Remove from heat and stir in 1 pound (450 g) of low-fat or non-fat curds or cottage cheese and 1 pound (450 g) fresh or frozen chopped spinach. Fresh spinach is wonderful, but it is only available for a few weeks out of the year over here. So I usually use frozen spinach. Thaw it first and make sure it is well drained. (What I do to keep excess water out of the lasagna is to sandwich the spinach between two plates and use them to squeeze it out over the sink.) Taste the curd mixture and add more salt if needed. This will depend on the salt content of your curds or cottage cheese. 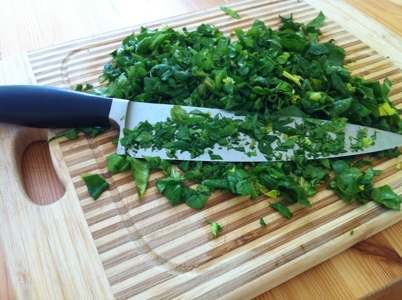 If you can get your hands on some fresh parsley, stir in 3 tablespoons of minced fresh parsley as well. If not, just use 1 tablespoon of dried parsley. Spray a 9×13" casserole dish with non-stick cooking spray (or just smear it with a bit of oil on a paper towel). Spread a small amount of the tomato sauce in the bottom of the casserole dish and reserve about a cup of sauce for the top of the lasagna. and 1/3 of the remaining tomato sauce. (You will need enough noodles to make four layers; the actual number of noodles will vary depending on their size.) Repeat layers twice (for a total of three layers) and finish with a final layer of noodles. Top with reserved tomato sauce. Place in preheated 350F/180C oven and cook for 30 minutes. Remove from oven and allow to stand for 10 minutes before serving. Optional: sprinkle with a bit of grated Parmesan cheese as soon as you remove it from the oven. 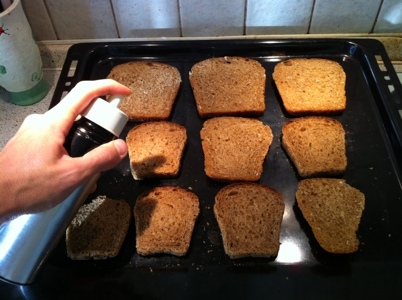 1) While lasagna is cooking, spray or brush whole-grain slices of bread with extra virgin olive oil. 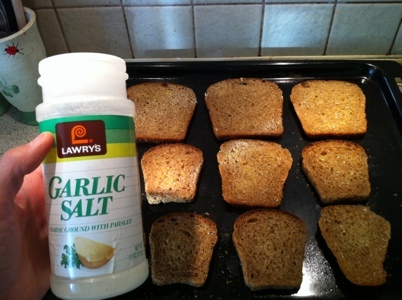 2) Sprinkle with garlic salt. 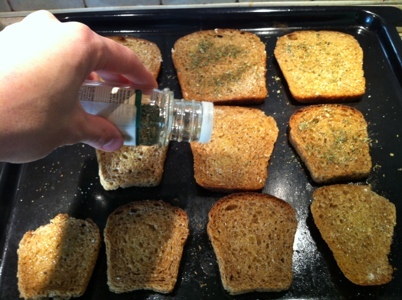 3) Sprinkle with dried parsley. 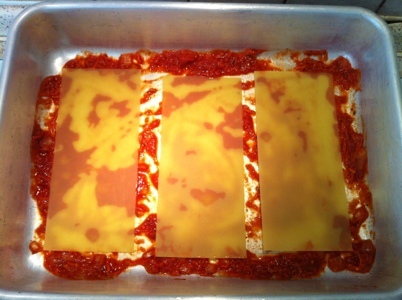 4) Place in oven as soon as you remove the lasagna. Allow to toast for the ten minutes that lasagna is cooling. Serve lasagna and garlic toast together. Preheat oven to 350F/180C. Sauté onions and garlic in a bit of oil in a medium pot over medium heat until onions are translucent. 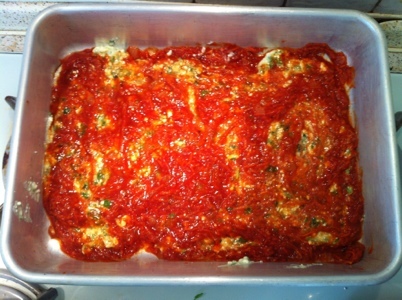 Add tomato sauce, carrot, basil, oregano, thyme, bay leaf, sugar, and salt and pepper to taste, and simmer, covered, until you are ready to assemble the lasagna. Put flour and 1 tsp. salt in a saucepan and drizzle in olive oil, stirring with a wire whisk. Use just enough oil to form a paste. 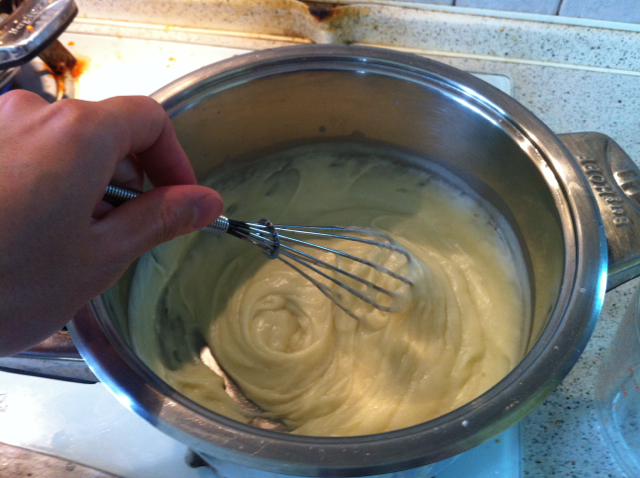 Add milk and cook over high heat, stirring constantly with a wire whisk, until mixture comes to a boil. Decrease heat to medium and continue cooking and stirring for a minute or two, until sauce thickens. (It will be extremely thick.) Remove from heat and stir in curds, parsley, and spinach, making sure that spinach is well drained. (If needed, place spinach on a plate, then place another plate, bottom-side-down, on top, and press over the sink to squeeze out excess water.) Taste the curd mixture and add more salt if needed. I would count it an honor to have the privilege of encouraging you on a regular basis! This entry was posted in Inspiration, Kitchen Joys and tagged food, recipes by Sharon. Bookmark the permalink. don’t know about availability where you live. but I use firm tofu instead of cottage cheese. crumbles well, mix with herbs, extra protein. Thanks for the tip. I’ve thought of using tofu instead of the curds, but it’s not available in our city. I’m in the process of trying to get the necessary things for making my own tofu (a rectangular mold for pressing the tofu plus either magnesium chloride or calcium sulfate for curdling the soy milk). Soy milk is insanely expensive here, but I make my own from dried soybeans that we can find at the outdoor market. So I’m just one step away from being able to make my own tofu . . .
Hi Sharon! You can make tofu with simple things that you have at home… I used an Ice Cream container that was in the right shape, Epsom salt and cheese cloth. When we first came out I picked up a Seventh Day Adventist cookbook – I think it dates back to the 50’s so it has tons of recipes that are very simple and use only things that regular people have in their kitchens! I can send you the recipe if you want PS Your site is great! That’s great to know, Becky! I’m not sure if we can get Epsom salt here, but I’ll have to do some research and find out. I’m glad you like the website; thanks for stopping by and commenting! Hi Sharon, I love homemade lasagna too! 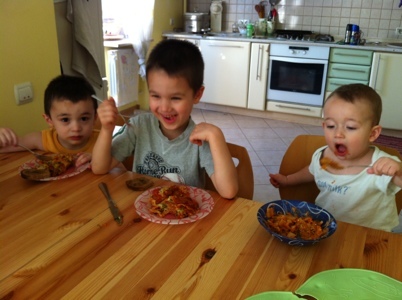 When we lived in Ukraine I made my own lasagna noodles. It’s really easy. I’ll have to give your recipe a try sometime. Wow! Homemade lasagna noodles! I hadn’t thought of doing that. We get ours from Hungary when we go to visit George’s mom. We can get them really cheaply there, but I’ve often wished that I could get a whole-wheat variety. If I made my own, I guess I could! 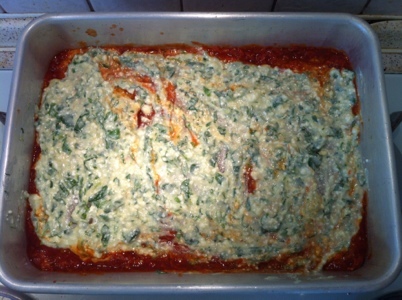 Hi Sharon, i love Lasagna a lot but had no idea on how to make …i just got something to do for the weekend! thanks a lot. That’s great! I hope it turns out well for you! Are you in Ukraine? If so, hopefully you can find lasagna noodles where you live. We live in Ternopil and can find them at Sil’po, but I know they’re probably not available everywhere. And, unfortunately, they can be expensive. We bring ours from Hungary where they are much cheaper. I hope it turns out well for you! I’ve actually come to like lasagna better this way than the way I used to make it. I think it’s the creamy texture of this recipe that makes the difference.